Since 2016, we’ve been mapping reliable repair businesses in London: initially in four boroughs in East London, and more recently in Camden, Hackney and Waltham Forest. Our goal was to make it easier for anyone to find a commercial repair option they could trust. Searching for repair businesses is often complex. 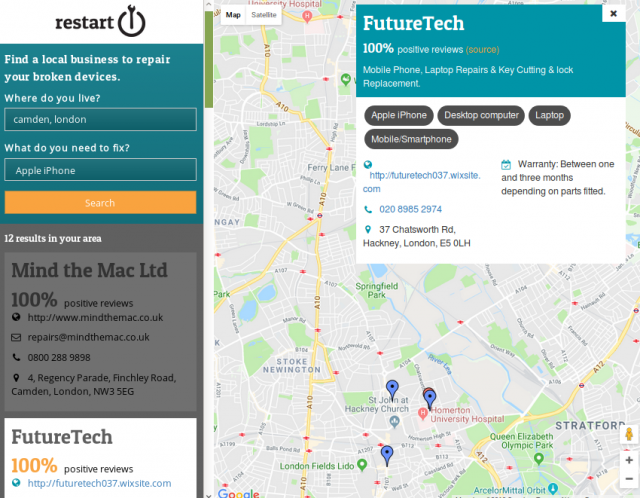 To help reduce our barriers to repair, today we are launching the beta version of our Repair Directory, a tool allowing users to quickly search for businesses based on location and type of device. We see the Repair Directory as a step in making repair more visible and accessible, complementing fixing efforts at Restart Parties. Community repair volunteers can play a crucial role in building the directory, by sharing insights on the repair economy and helping keep data up to date. We’d like to thank digital agency Outlandish for their precious support in developing this first version of the directory. As part of the launch, we’re releasing a list of reliable repair businesses for Camden, Hackney and Waltham Forest. This work was part of a collaborative project we did with Hackney Fixers, funded by the North London Waste Authority. Overall we identified 201 electrical and electronic repairers in the three boroughs of which only 35 met our criteria: at least 80% positive online reviews and offering a warranty on repairs. The criteria on reviews proved the most difficult for businesses to meet, with only 43% of businesses having at least 5 reviews, the minimum number in order for us to assess them. Of those with enough reviews only a third had over 80% positive reviews, suggesting that there may be a need to pay more attention to customer service in the sector. Our findings also imply that the potential for consumers to be influenced by reviews is not sufficiently appreciated by the sector. If you are wondering why a business that you know is not included then it is most likely because it has too few reviews, so we would encourage people to leave reviews so we can consider these businesses for inclusion in future. There is no denying the massive and growing problem with “fake” reviews, either negative reviews left by competition, or positive reviews paid for by businesses. A recent exposé by BBC showed how simple it is, even on platforms like Trust Pilot. We are aware of this, and actively looking for ways to address this in our Directory. Through this work we want to encourage people to support the local repair economy, and start building links between commercial repair and community repair at the local level. At Restart Parties in North London we have printed versions of the lists of reliable repairers, also including tips on where to donate working electrical equipment for reuse. Participants at Restart Parties last November and December liked having access to this information, with 93% saying they would be more likely to use local repairers and 83% are more likely to donate equipment for reuse. We’d like to expand the directory to cover the whole of London, and extend it to other cities with a vibrant repair community. In order to do this, as well as to keep the directory up to date, we are looking for partners to support us. Find out more about how the directory works and get in touch if you’d like to help us with it or to provide feedback. Building on work in East London, the aim is to discover as many relevant businesses as possible in three North London boroughs, collect data on them, and then develop and apply criteria for reliable businesses.